On Town Meeting Day, the two wards in Burlington's New North End — 4 and 7 — played host to the most action-packed races for city council seats. Both Republican candidates — Kurt Wright in Ward 4 and Tom Treat in Ward 7 — made the case that if they weren’t elected, the party would lose its presence on the council. In Wright’s case, that argument — or possibly his long experience in public life — proved compelling. Wright edged out Carol Ode, a Democrat who served on the school board in the past but was making her first run for city council. 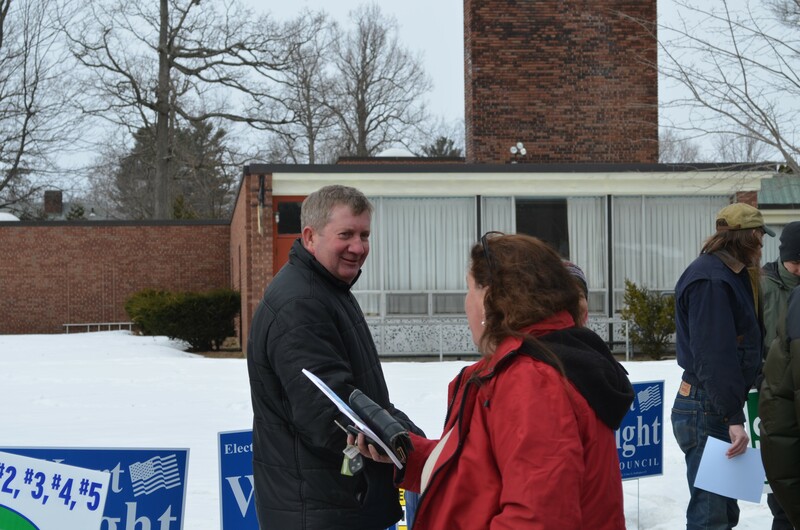 Wright received 1,089 votes to Ode's 709. A third candidate, Loyal Ploof, received 26 votes. For Treat, the message appears to have had less traction — Ward 7 voters opted for Democrat Bianka Legrand, who gained 768 votes to Treat's 682. Legrand, who came to Burlington at age 17 as a refugee from Bosnia Herzegovina, said she was running to promote a strong community in Ward 7. Neither Legrand nor Treat had run for a council seat before. Legrand said of the outcome, "I think it indicates resident of Ward 7 are more than ready for some change." Her first step, she said, will be to sit down with other councilors and get up to speed on the issues. Democrats depicted the two New North End races as a possible bellwether event, suggesting that if Ode and Legrand triumphed, it would signal the neighborhood is drifting leftward. 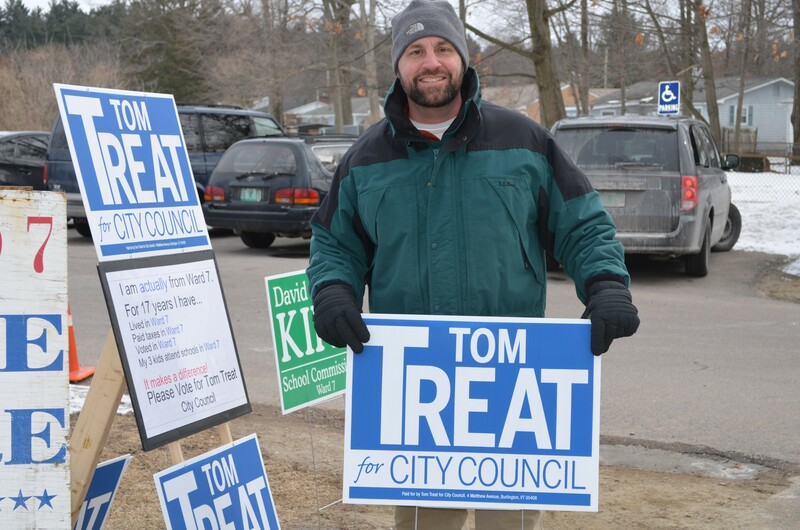 Treat said he was grateful to his volunteers, and attributed the vote's outcome to insufficient turnout. "While many people did come out for me, enough of them seemed to stay home." But Wright stalwarts outnumbered Ode's supporters. Patty Dow said Wright is her neighbor, and her decision to vote for him was never in question. Still, Ode said the race whet her appetite for political campaigns. "I absolutely loved going door to door and seeing the people of Ward 4," she said. "You can definitely expect to see me in future races," Ode added, making it clear that could mean another city council campaign or a run for a legislative seat. Only one of the other five city council seats up for a vote on Town Meeting Day was challenged. Progressive Rachel Siegel easily secured a second term in Ward 3. Ron Ruloff, an independent who’s run unsuccessfully for the council in the past, received 157 votes to Siegel’s 560 votes. There were no surprises in Ward 1, where Progressive and first-time candidate Selene Colburn ran unopposed. Democrat Molly Loomis had planned to run but several days before the deadline, she opted out, citing personal reasons. The race in Ward 2 was equally predictable: Progressive Max Tracy ran unopposed to win his second term on the council. Tracy’s challenger, Democrat Ryan Emerson, had dropped out of the race after Seven Days inquired about two relief-from-abuse orders granted against him. Incumbents Chip Mason, a Democrat, and Karen Paul, who recently changed her party affiliation from Independent to Democrat, didn’t face challengers in Wards 5 and 6, respectively.